Just learned that Uncle Bill Tapia fell and broke his hip a few days ago. 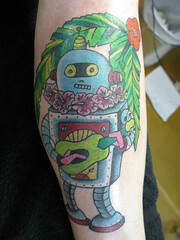 A quick operation, everything pinned back together, and he's mending in a rehab center. I'm for this. Good song. Good lyrics. Yes, even more. David Cain sings, plays, and juggles while creating a tune. Q: What is the second most frequently asked question* in the English language? 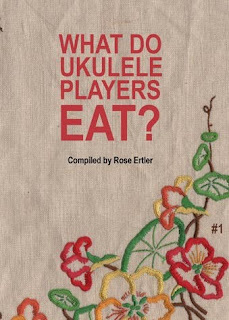 A: What is the ukulele player going to wear when s/he performs for the Queen of England? Jake Shimabukuro ponders the question here. And don't miss the video of him giving the new jacket a test run in the fitting room here. * As everyone know, the most frequently asked question in the English language is "Is that the banjo player's Porsche?" I have tried to avoid blogging this video, but I now compelled to say that if this ends up getting more hits than Jake's Central Park While My Guitar Gently Weeps video, I'm just gonna give up. Truth be told. This keiki's version of Jason Mraz's I'm Yours doesn't really showcase his talent. Watch him get his full Shimabukuro on this video of Gently Weeps. If more ukes end up under the Christmas tree this year, I think we can all thank this little guy. Check out this video of The Coolest Band Ever, The Maestrosities. See if your heart stops about 1:50 mark when they juggle and pass 6 ukuleles. Mine did. Then I realized they're prolly not vintage Martins. The Maestrosities also have some upcoming NY shows. More info here. UPDATE: Jason from Sonic Uke sez "it's only two but we play them too." At least they didn't drop the towel. Here it is at last. The Motherlode. The Big One. Enough Christmas Carols, Hanukkah Songs, and miscellaneous holiday ukulele music to choke a reindeer. Chords, lyrics, chord arrangements, solo fingerpicking, you name it. 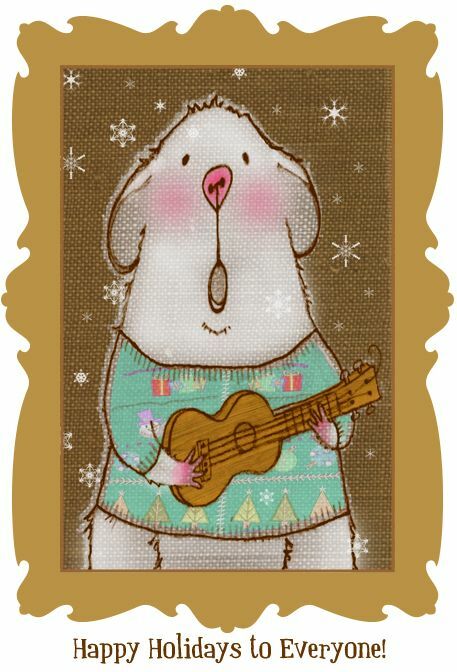 We hope you enjoy playing and sharing your uke with friends and family this holiday season. A big addition this year is Dominator's two-video tutorial on how to play Aldine Guerrero's arrangement of The Christmas Song. An easier (but still plenty challenging) arrangement of this old Chestnut is Narciso Lobo's (download it here). And please, if you know of any sites or charts that we've overlooked (or discover a broken link), leave a comment via the link below and we'll add them to the list. Yeah, Yeah, I know...not normally the kind of music I come across in Ukuleletown. But this guy has an infectious style that gets across to kids. Yeah, there are a few kids in Ukuleletown. Free-range kids that like what they like and listen to what they listen to. Jake Shimabukuro and Bette Midler meet the Queen at the Royal Variety Performance yesterday. The performance will be broadcast on December 16th, so I'm expecting someone from across the pond to post a clip of Jake and Bette's performance (please!). Caveat: to download/vote for the track, you need to "friend" Microsoft, at least temporarily. Fun fact about "Tears That I've Cried": the percussion loop is actually producer Tim Cohan's belt buckle. We call it the belt loop. It's a viola scale and bodied ukulele made by renowned violin maker Robert McCluskie, senior luthier at the Potter Violin Company. It reminds me of the fretless ukulele that my friend Tuba made out of violin back in our Ringling days. Check out Cathy and Marcy's other instruments, too, including a sweet Talsma ukulele modeled after the Martin MC3H Marcy Marxer Signature Model Guitar. Don't forget Roger and Dave's Beatles on ukulele marathon benefit for Yoko Ono (whew!) this Sunday, December 6, 2009 at the Brooklyn (NY) Bowl. Nice profile yesterday on A.V. Club. Peter Hurney is the luthier behind Pohaku Ukulele in Berkeley, California. I have three of his instruments and they have a sound that is as unique as they are. His workshop is a separate building behind his house and it’s there he produces some of the most unusual and musical ukuleles on the scene today. What I like first about Peter’s work is that it is superior craftsmanship. His woodworking skills are amazing…and they have been honed through many other projects other that just instrument production. On his website under “Other Stuff” you can see some of the beautiful and fanciful creations he has built. So, what do Peter’s ukuleles sound like, and why would you want one? The sound of a Pohaku, to my ears, is very clear and precise. I have one in koa and one in mahogany, and, although they both have their own unique sound, they have an identifiable quality that they share: they aren’t muddy and have a good snap. For recording, especially, this is a marvelous quality. Beyond the sound is the appearance of a Pohaku ukulele. Noted ukulele players like Bliss Blood, Ami Worthen, Tippy Canoe, Uni and her Ukulele, Kitten on the Keys, etc…all use Pohakus on stage. They look great and survive the rigors of performance. Peter has an entire section on his website of “art ukuleles”; ukuleles that are “themed” or have some special artistic merit. Pohaku prices are very reasonable for a good performance instrument; i.e. an instrument that stays in tune, intonates properly and sounds great night after night. Peter Hurney, himself, is very easy to work with and has a great sense of humor. Here’s a video of me playing a custom koa Pohaku concert ukulele. Now the film adaptation of "Me and Orson Welles" is hitting the theatres with Zac Ephron starring as the young uke-player (aged for the film to provide a heartthrob marketing angle, we suspect). Now all we need is a High School Musical ukulele to make this a trifecta. And, wonders of wonders, there is one. Congratulations to Jake Shimabukuro on being invited team up with Bette Midler in a performance before Queen Elizabeth on December 7th. "I was shocked to hear that Bette Midler knew my music. I've been a huge fan of hers for many years," said Jake. "She's like a queen of entertainment. 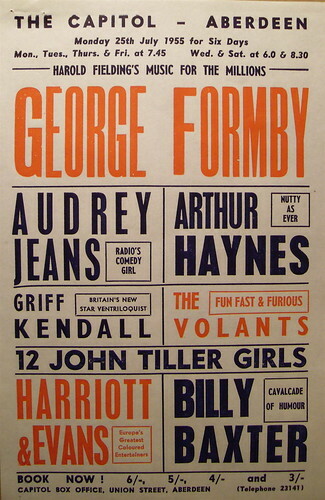 And to be performing with her for the Queen of England... it's a bit too much for me. I'm just so honored." The Old Blind Mole Orkestra from France is led by an amazing ukulele player and songwriter named Steve...this is their new video. dig it. This is pretty neat. 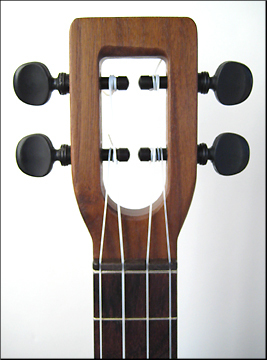 Peghed brand geared tuners are now available as an upgrade option on Flea and Fluke ukuleles. They look like old-school friction pegs, but have 4:1 planetary gears cleverly hidden inside. Order 'em via the Flea Market Music site. As one would expect, Shimabukuro wanted the new uke to be a real player, but affordable to as many people as possible (especially kids). A quick glance at the press shot of the uke shows some unexpected details in an entry-level instrument, notably the long neck (14 frets to the body) and extended fretboard (19 frets altogether!). The MIGM uke will play a key role in supporting “Four Strings for Kids,” a program dedicated to making the ukulele available to children all over the world. A portion of the online only sales of the uke will go to support MIGM's outreach programs. 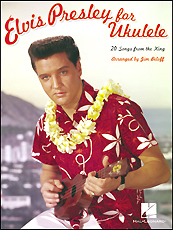 This is the first installment in what I hope will become a monthly feature on Ukulelia. Each month I will discuss a maker of custom ukuleles; how they look, how they sound, why you should get one. This is more or less subjective on my part, although I have bought and sold string instruments all my life (Is this self-serving? Probably, but it's the way I'm going to approach it.). I won’t discuss any instrument in this series that I haven’t actually played. Before I get into a specific builder, I guess there is the question of “why?”. Why buy a custom ukulele when there are so many good production ones out there now? For me, the answer to that is easy. I like to think that the music I make is unique and personal. I think all musicians consider their sound unique and personal. One step in achieving that is having an instrument that was designed specifically for you. To produce a sound that is specific to you. The other reason is to have a dependable instrument to play that, no matter how much you play it, you never discover all the sounds it can make. Sometimes when I look at a ukulele I just want to play it so I can hear it make “that sound”. To start off, I’m going to take a look at Kepasa Ukulele in Burlington, Vermont. The luthier is Kevin Crossett. “Build light, build loud, build often! Kepasa Ukuleles are designed to have a full and warm tone. 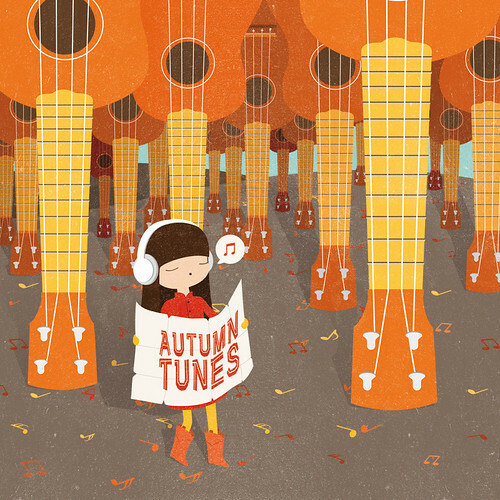 I prefer this sound for fingerstyle ukulele and chord/melody style ukulele. The two Kepasas I own are based on the Stewart “LeDomino” from the Twenties. They have a 14” scale, which is between a soprano and a concert, and are strung with concert gauge strings. This gives them a punchy, loud sound with a lot of depth. Although the top of a ukulele is important to the production of sound, the “body sound” what defines and broadens the sound. Kevin’s ukuleles have a warm sound. The mahogany ones are darker with more sustain and the koa ones have a surprising amount of bottom end. The necks are fast and smooth and the ones with a 14” scale give just a bit more room. The saddle is compensated. I’m not one who ‘scopes the intonation, but I can hear if it’s off. I still feel conflicted about “strings through the body” method of anchoring the strings; it makes them harder to change, but I never worry about the bridge flying off. (I have had that happen occasionally with older ukuleles). Kevin makes a number of "standard" styles, these are just one of them. Right now Kevin’s prices are extremely reasonable, but the demand for his instruments is going up. Kevin, himself, is a great, easygoing guy and a joy to work with. Cheerful and self-effacing, he will give you a due date and stick to it. (This is a good thing in the world of luthiers). He has a music store in Burlington (Guitar Sams) and has a great ear for the sound of a good instrument. Rather than make these articles too long and unreadable, I have opted for hitting the high points. If you want more info, contact Kevin; he's an easy guy to talk to. December 5th and 6th, 2009. Be there, or be Sutcliffe. If you missed your chance to buy the Dairy Queen Ukulele the first time around, get out your checkbook. The first and original Warren Buffett DQ Uke designed by me and lovingly crafted by luthier extraordinaire Dave Talsma is up for auction. As you may recall, the Dairy Queen Ukulele was auctioned off to benefit the Children's Miracle Network, and was purchased by the online casino GoldenPalace.com for over $11,000. Don't be fooled by the kitschy appearance. This is fine instrument and an outstanding player in the true Talsma fashion. I'm tempted to bid on it myself. Janet Klein sez vote for her to return to Maxwell DeMille's Cicada Club in 2010. Ian Whitcomb is on the ballot, too, so click for 'em both! Mary J. Martin Accompanies "The Lost World"
...and she can whistle too! Alison Losik from Eugene Oregon. Nice jazzy style, nice jazzy tunes. Gotta appreciate a girl who can whistle this good. "The annual Paris Uke Fest has showcased an international array of ukulele superstars—including some of Brooklyn’s most talented players of this 4-stringed little instrument. On October 8, the Paris Uke Fest in Brooklyn will feature performances by local and international ukulele stars (coming from as close as Park Slope and as far as Australia! ), Paris Uke Fest alums, French-themed music, and a special appearance by Paris Uke Fest founder Lionel Hubert with his experimental duo U.K.E. Hosted by the incomparable Sweet Soubrette at the charmingest venue in Brooklyn, Red Hook’s Jalopy Theatre. Comme c’est magnifique!" "On Thursday Oct 15th (just after your Noir! ), Lionel and Antoine will perform on the Cape at the Hot Chocolate Sparrow in Orleans at 7:00. Tim Sweeney will open for them." "I was a member of the folk group, the Ukuleers, in York County [PA] back in the '60s. We landed in time between Arthur Godfrey and Tiny Tim. This article hit in the same week Mary Travers died. She was my idol and the Ukuleers were Peter, Paul & Mary wannabes. You want to see geeky and hip? Here's a picture of us circa 1965. "I never posted an image to a board, so I hope you can see this because it's a good chuckle. That's me at age 14 holding the tenor uke, with the bow in my hair. I was the youngest. On the left is Rick Bowen, now a music professor in Indiana. Joan Kling became a nightclub singer. Denny Updegraff, the bongo dude, and Dave Myers, on the right, did not pursue musical careers as far as I know. We eventually graduated to one guitar, three baritone ukes, and bongoes. In perfect 4-part harmony, we covered Dylan and PP&M, of course, as well as spirituals, Pete Seeger, and even "Ragdoll" by the Four Seasons. We lasted three years. A big payday was $5 apiece, but it kept us in instruments, felt picks, and outfits. It was the most fun ever and, ask anyone, we were really good. Glad to know ukuleles are back!" Ukuleles are back. Now let's hope the Ukuleers are, too! "A customer provided me wood from a very old apple tree taken down on his family property. Along with the wood came a story of how a rope that was used in taking down the tree got tangled up and came dangerously close to strangling the customer and turning him into the unfortunate woodsman. Fortunately he survived to have a section of the tree turned into this soprano ukulele. After considering his story I chose to whimsically tie the rope theme into the artistic composition of the ukulele. Fruit woods have been traditionally used in instrument construction over the years however rarely commercially. I measured the dimensional stability of the wood before commencing construction and found it to be an amazingly stable choice of wood. The body and neck are made out of the Apple and I mated it with a Sitka Spruce soundboard which has a bear-claw figure to it." Who was that customer, you may ask? 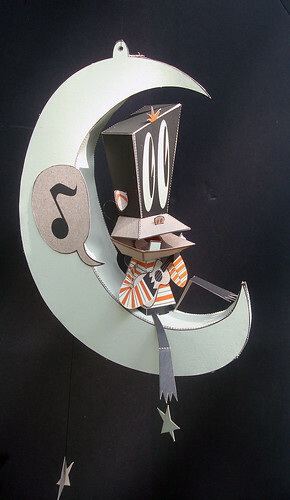 "Say it's only a (ukulele playing monkey sitting in a) paper moon..."
Or say it's a new paper toy designed by Matt Hawkins. "3 color screen print on chipboard. Debuting tomorrow night at the Proper Assortment show at the Emerald Space in KC west bottoms. I'll put em' up in my Big Cartel sometime next week. 200 limited edition printed by the fantastic Vahalla Studios. Inspired by the song It's Only a Paper Moon." Over the weekend, crooks stole 25 Kamaka ukuleles from Hale Kula Elementary on Oahu. The twist? Hale Kula is located within Schofield Barracks, and in order to get in you have to show identification, vehicle registration and proof of insurance at the military checkpoint. Let's hope that checkpoint records plus the fact that all the Kamakas have "Hale Kula" written on the headstock and stamped on the sound hole sticker will mean that the culprits are completely lolo and trip themselves up quickly. ...and perhaps you will even hear them do a song together. This is a great venue, right on the river. If you're anywhere near Chicago, you should come on out. Where Pia Tedesco has been tearing them up with her monthly presentation of "Cabaret Freaks"! Great vocals+ukulele+claps. How come this song sounds so much better with a French accent???? Now you can let your UkuFingers do the walking. Swell new app for iPhone and iTouch. "Uku Fingers is more than an ukulele chord chart that shows you one way to play each chord. It shows you ALL the ways to play each chord – anywhere on the fretboard. Chord forms are color coded to quickly and easily find which inversion or fretboard placement makes the most sense. You can look at multiple chords together so you can see how they relate to each other (like the chord progression of a song), or how you can play chords at a different part of the neck to help with arrangements. You can also show scales along with the chords to find melodies or embellishments. Once a chord progression is loaded in, transposition is as easy as pressing a button. It even will show you relative pitch or the note names. Uku Fingers helps you to be a better player." Meet Susie Asado, aka Josepha Conrad, a songwriter, poet, lover of sweet tea, and ukulele player from Berlin. She has some US shows coming up, notably September 7, at Cake Shop in NYC. “I noticed many groovy, fit young people in the queue for tickets for our Proms concert, the kind of person I used to be,” he said yesterday." 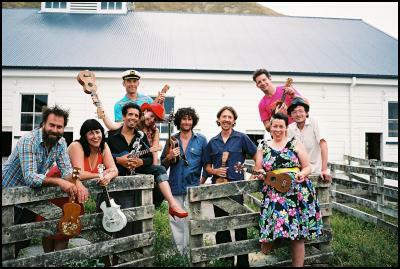 "The Wellington International Ukulele Orchestra are chuffed to announce their national tour in support of a brand new record, The Dreaming EP, which will include towns that have not yet hosted the wildly popular strummers." We were indeed saddened to hear of the passing of young uker Killian Mansfield. As you may have read earlier on Ukulelia, he recently released a CD, proceeds from which will support the foundation named in his honor. Please buy one. "Killian Mansfield, 16, of West Shokan, NY, artist, musician, humanitarian. He waged a valiant battle against a rare form of cancer armed with an infectious sense of humor and a life force to be reckoned with. "He took up violin at age 3 and continued his dedication to music, winning an award for his elementary school music program (PS 24 in The Bronx, NY), and participating in what he called “an outstanding string program,” at Onteora High School. As a participant of the Fiddle & Dance camp run by Jay Ungar and Molly Mason at the Ashokan Center, he picked up the ukulele — an instrument that enabled him to continue playing music despite the limitations cancer imposed on his body, and made such an impact that a Pavilion is named in his honor. "He loved the ukulele for its simplicity and ability to encourage egalitarian musicianship in young and old, professional and beginner. His philanthropic devotion was similar in its focus on empowerment. He wished, “more kids with cancer knew that choosing to eat well and doing acupuncture, reflexology, aromatherapy and the like can make them feel better.” He started the Killian Mansfield Foundation to help children with cancer and other serious illnesses through health care that treats the whole child- mind, body and spirit. "In the last few months of his life with the assistance of world class musicians like Dr. John, Kate Pierson, John Sebastian, Todd Rundren, Levon Helm and many others, he summoned up all his fading strength and recorded Somewhere Else to benefit his foundation, and to send another message of empowerment for seriously ill children and teens." For those of you who, like me, really like rope binding on a ukulele; this custom ukulele from luthier Peter Hurney of Pohaku Ukuleles is the bee's knees. Meet Shelley O'Brien, a Toronto-based, B.C.-raised ukulele player. "She recently released an enchanting album of quirky pop music, You, Me and the Birds , and is currently in Europe carrying her custom-made 'uke' toward the Second Helsinki International Ukulele Festival (Aug. 21-23), where she'll be the lone Canadian representative." "Afterwards, in one of the slower numbers, the audience replaced lighters aloft with ukuleles aloft which was a strangely poignant sight. "I bet U2 don't have that"
"More than 1,000 people, including Proms director Roger Wright, had brought their own ukes along for a communal performance of the Ode to Joy from Beethoven's Ninth. It sounded curiously Venetian, a bit like a serenade. As a non-uke person, I ended up rather wishing I played one. Tremendous." I've been enjoying the hell out of Lil' Rev's latest CD, Drop Baby Drop. It's loaded with rare blues, rooted originals, novelty, old time country and rusty old tin pan alley classics performed on concert, baritone, banjo- and resonator ukuleles. 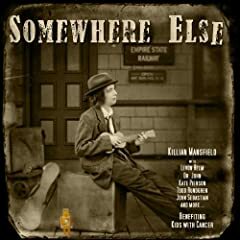 "SOMEWHERE ELSE is the dream project of Killian Mansfield, a 16-year-old ukulele wiz from Woodstock, NY who has an advanced and rare form of cancer. Recorded In a window of time between a long hospitalization last winter and entering hospice care this spring, SOMEWHERE ELSE is an eclectic and uplifting labor of love. The album includes original songs and eclectic covers performed by Killian on 'uke' with critically acclaimed singers and musicians including Dr. John, Kate Pierson, John Sebastian, Todd Rundgren and Levon Helm. SOMEWHERE ELSE is a benefit recording for the Killian Mansfield Foundation, which supports integrative therapies like acupuncture, aromatherapy, reflexology and nutritional advice for children with cancer." Go buy Killian's CD now! There's a movement afoot to keep it in the top 100 albums on Amazon, and it seems to be successful! (It's also available on iTunes.) Proceeds benefit the Killian Mansfield Foundation and the Hope & Heroes Children's Cancer Fund. It's been a while since we checked in with the Langley Ukulele Ensemble. They've been a busy bunch, releasing three CDs this year and now just returning from a grand tour of the Islands. Maybe this'll finally get my daughters interested in the uke. Looks like James Franco will be seen serenading Julia Roberts in their upcoming flick, Eat, Pray, Love. What's he playing? My best guess is an older Bushman Tenor.